Growing in the river bottoms of the deep South, sweet Pecan (Carya illinoensis), as it is called there, produces not only its celebrated nuts, but also a wood in the Hickory family of distinctive beauty. With its creamy sapwood and abundant reddish-brown heartwood, along with characteristic brown, black, and red streaks and frequent bird peck, it is more exuberant than the relatively sedate hickory wood to which it is kin. Availability of Pecan is sometimes spotty due to logging seasons curtailed by high water in winter and spring in Southern rivers. But sited in these overflow lands along rivers, Southern Pecan is a relatively fast growing tree and yields wider widths and better lengths than hillside, droughty-site Hickories. 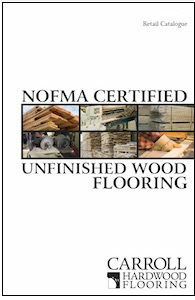 Please download our Unfinished Hardwood Flooring Retail Catalogue from the tab to the right. See Hickory pricing and grade descriptions. Pecan prices may be obtained by adding $1.00/SF to Hickory prices. 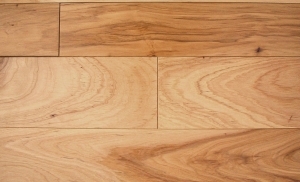 With sapwood that is cream to beige and heartwood that is a light reddish-brown, this wood does not exhibit the contrast seen in Hickory between the paper-white sapwood and dark brown heartwood. Nevertheless, even in Select it is full of interest with color variation, streaks from black to reddish-brown, and bird peck so common that it must be admitted in this grade. Knots and discoloration in the sap are excluded. As hard as Hickory, Select Southern Pecan generally has better average lengths. Southern Pecan is available in a Natural finish. Pecan will never be as rustic in appearance as Hickory. Growing in tall river bottom stands, Southern Pecan prunes up quickly and tends to have long trunks free of limbs and knots with a tuft of leaves branching in the top of the canopy. Character Pecan will have some sound knots, bird peck and worm hole without limitation, bark pockets, and sapwood that may exhibit some grey or blue. 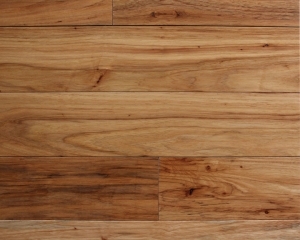 Character Southern Pecan flooring is available in a Natural finish.